Bisimulation between processes has been proven a successful method for formalizing security properties. 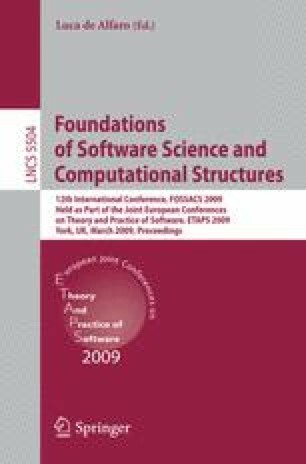 We argue that in certain cases, a scheduler that has full information on the process and collaborates with the attacker can allow him to distinguish two processes even though they are bisimilar. This phenomenon is related to the issue that bisimilarity is not preserved by refinement. As a solution, we introduce a finer variant of bisimulation in which processes are required to simulate each other under the “same” scheduler. We formalize this notion in a variant of CCS with explicit schedulers and show that this new bisimilarity can be characterized by a refinement-preserving traditional bisimilarity. Using a third characterization of this equivalence, we show how to verify it for finite systems. We then apply the new equivalence to anonymity and show that it implies strong probabilistic anonymity, while the traditional bisimulation does not. Finally, to illustrate the usefulness of our approach, we perform a compositional analysis of the Dining Cryptographers with a non-deterministic order of announcements and for an arbitrary number of cryptographers. This work was carried out while Konstantinos Chatzikokolakis was visiting Oxford University. Chatzikokolakis wishes to thank Marta Kwiatkowska for giving him the opportunity to collaborate with her group. Authors Norman and Parker where supported in part by EPSRC grants EP/D077273/1 and EP/D07956X/2.